Besides brushing, flossing must be part of your everyday dental care routine. However, it is only effective at keeping your mouth healthy if it is done correctly. 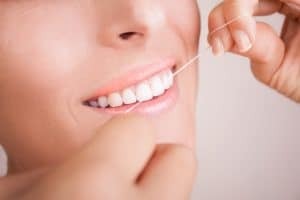 It is essential to learn some essential flossing tips so that your teeth and gums remain as healthy as possible. The American Dental Association recommends flossing after meals and at bedtime. Using the correct technique is vital to remove trapped food and debris from the mouth. When plaque is not allowed to build, tooth decay and gum disease can be prevented. Here is the best method for flossing. Begin with approximately 18 inches of dental floss. It should be wound around your middle fingers. As the floss is held tight, it should be slid in between each tooth. It is imperative to use a gentle touch so that gums are not injured. To remove all of the debris, the floss should be wrapped around the bottom of every tooth and below the gumline. As you progress, use clean parts of the floss. Choosing floss is like selecting a toothbrush. It is an important tool in your oral care routine. Nylon is the most common material for dental floss. It comes waxed or unwaxed. Also, it may be purchased in a number of flavors. If your teeth are very close together, regular floss may shred and break. In this case, simple filament floss is a smart alternative that will be easier to slide into these types of spaces. If you are interested in learning how to properly floss your teeth or other ways to keep your mouth healthy, consult with the dental experts at the office of Dr. Dana Walters. The entire staff is willing to help you care for your teeth and ensure a beautiful smile.